IT ensures your business runs smoothly, and you deliver superior employee/customer experiences. Being able to plan, build, and operate a new IT operations management solution presents a challenge to many organizations, due to budget and resource constraints, or simply a lack of experience and in-depth expertise to perform critical changes. 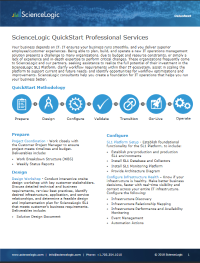 These organizations frequently come to ScienceLogic and our partners, seeking assistance to realize the full potential of their investment in the ScienceLogic SL1 Platform, clarify workflow requirements within their IT ecosystem, assist in scaling the platform to support current and future needs, and identify opportunities for workflow optimizations and improvements. ScienceLogic consultants help you create a foundation for IT operations that helps you run your business better.